I’m still collecting my thoughts on the new Apple iPad, but I wanted to share with you a side-by-side comparison shot of the iPad Case and the Newton MessagePad Keyboard Case from 1996. Back when laptops were 6-7 pounds, bringing around a 2-3 pound Newton, external keyboard, and Ricochet wireless modem was perfect for checking email and writing short documents. While on tour with Autumn Gem, Rae and I having been traveling with two MacBook Pro laptops. It certainly gets heavy lugging around 15 pounds of computers, adapters, and cables around. We’ll still need to bring one MacBook Pro with us on our next tour, but I can see the iPad replacing the other one. With the iPad-VGA adapter, we’ll even be able to run our presentation and film straight from the iPad! While the output is not HD, it’s more than adequate in the venues we’ve been screening Autumn Gem in. The iPad really is a great device for creative professionals who want to showcase their work: photos, videos, illustrations, you name it. 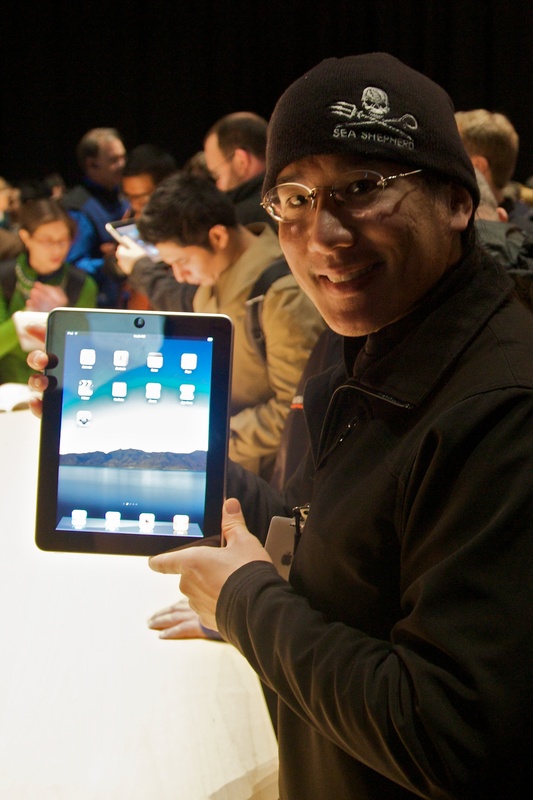 Here’s a photo of me from the Apple Special Event introducing the iPad. More thoughts to come soon! Nice use case. I’ve been personally thinking the iPad could be an incredible “first computer” for kids. Very excited to hear more from your actual use of the device. The Case looks very handy and you can use it in many different ways. Digital picture frame, protection and for easy typing etc.. I have heard that the price is will be 39$ which sounds pretty good! you guys should def check out the new iBallz for the iPad, there goofy, but great! I was told the iPad contained a major component manufacturered by PVI/e-ink subsidiary Hydis, located in Korea. A friend of mine who got his hand on one opened it up and sure enough they’re using FFS technology only created by this Korea firm. Unfortunately I don’t see the appeal in this device. If you own a Mac and/or an iPhone it seems like you’ve got the bases covered. Reading an LCD screen will give you a headache in no time. I’m not a fan of ereaders, I much prefer books and I’m a avid Mac user! I believe this is another money sucking device with no productive application. It’s power configuration is impressive (standby time) but it seems, in my opinion, to be another gizmo from the minds in Cupertino without a true purpose. At best I expected a tablet with the same capabilities as the MacBook I’m typing on. Deep down inside I knew it would be a big iPod touch. The netbook, tablet PC, and ereader markets can breathe a sigh of relief. Wow, that looks pretty sweet. It would be actually great if there’s a case which also adds more interfaces. Like a Docking Station for a Notebook. However, just a regular case is fine for now I guess :).